There has been some talks on various busa boards on gen2 secondary injector control. For some reason I gather there is a perception that secondaries as such should be used for boost enrichment. I find this idea a bit "raw" in that sense that the reason for having two sets of injectors is to have an optimum atomization for given air velocity to maximize the power and torque. Suzuki has made a map which select how and when secondary injectors come on based on this principle of maximizing power and torque. The haynes book called engine management theory (p60-61) summarizes this injector position very well so lets quote them here in chapter where they talk about the incoming air shearing the fuel droplets for maximum power: "The most practical solution is to have two injectors per cylinder, one witted close to the engine, and aimed at the injet valve, the other as war away from the engine as possible. At low air speed//engine rpm only the inner injector triggers. At wide open throttle you run both inner and outer injectors... you need engine speed and load for the outer injectors to be effective... The end result of running double injectors in this matter is an undetectable switch-over from dingles to doubles, and a gain in peak bhp; typically over 4%". So the injector control is one issue, but boost enrichment is another. As suzuki has designed the system for best power and least emissions with their maps selecting when secondary injectors come in play we should not consider using only the secondary injector control for generating boost enrichment. Rather we should generate a system that regardless of injector selection table detects required enrichment based on intake pressure below the throttle flaps (i.e. boost). Basic concept for boost enrichment should be very easy: Rewrite IAP sensor code so that below 0bar the sensor emulates an IAP sensor and above 0bar it generates enrichment using fuel using injector constant which will be made a varible that changes using IAP sensor values. 1) If pressure is <=0 bar then adjust the GM3bar sensor data to emulate IAP sensor values. 2) If pressure is > 0bar then set IAP sensor values to maximum allowed and use a conversion table that changes the injector_size_variable based on the sensor readings. I.e. 1.2bar would generate a 1.2x more fuel to the engine. 2. 0bar t0 3bar fuel multiplier table, i.e. fuel enrichment based on boost. Maybe as a two dimensional map with RPM on the other axis. Additionally we infor if the injector capacity defined by suzuki is enough for turbo applications and the exact fuel pump capacity and replacement. Luckily we can choose bigger injectors (all 8 of them) and set the injector size constant to reflect this. Not a difficult thing, just requires a couple of evenings to write the programming logic and initially test the code. The key thing here is that I dont need this kind of feature for my own engines, so before doing this would like to know if there is real need for this or is it just talk about a feature that would be nice to have but with only few users... ??? Also would need commitment for research the map data and testing. This is not a promise to implement the above, this is just a documented result of thinking during a 6 hours drive back from the local speed day event. EDIT - just noticed that there is something going about the boost enrichment also on gen1 board. Lets hope that the thinking on boath boards can accumulate knowledge. Regarding gen1 JaSa will support stocker on the project, I dont have the gen1 disassembly anymore active - but if I move forward than the gen2 proof of concept should help also gen1 and vice versa. Marc - quite contrary. Your questions and some comments on other boards initiated the thinking process and while spending 2x6 hours in car alone sometimes things just become clearer. Minimum this helped to clear out the thought that we are currently running single injectors withour 8.3s bike (foot shifting without fuel/ign kill 1" or so longer than stock") so definately will try out the dual setup for 4% increase. About boost enrichment, I may look into it. Lets see in time, but only for gen2. Have not measured the extra capacity of secondaries, but from programming perspective - as long as we just know the fuel amount ecu knows how to split the fuel betwen primaries and secondaries. As I personally have No intentions on running a Turbo now or in the future, I would still like to see EE2 cover as many bases as possible.......provided Petrik has the time to do this?? ( I wish more people...including myself or anyone for the matter, understood this stuff as well as Petrik does to help out with sharing the load) Mainly just to kick the Crap out of Rip-Off Companies like DJ & Bazzaz! Further more, If this "Fuel Enrichment" idea helps with bringing the N2O program/feature along I'm ALL for it, and I will help out wherever I can. PetriK i think many are used to secondary injectors for top end turbo stuff but realy it doesn't matter too much how many injectors you have except for the limits of tuning injectors for idle/cold start /part throttle AND having enough fuel available to make the desired hp. also its easier to think in absolute pressure when looking at these things, no need to differentiate above and below ambient pressure all we need do is extend the range to suit our needs. 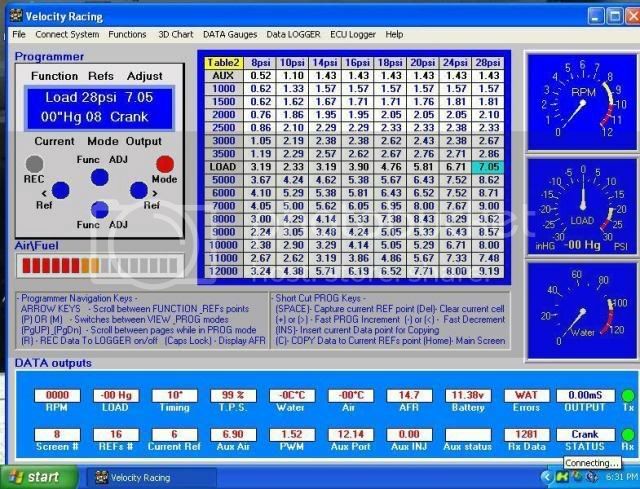 Is there a calibration table for the iap and sap ? or is there a table that sets the relationship of iap and sap, there is still lots of uncharted territory within the maps and tables that could be very usefull in this sort of application. Proof of concept on gen2 ecu is ready with positive results. - The IAP sensor signal affects both injectors. When exceeding injector capability it looks like an errorcode is thrown, but that may be only the desktop setup that was not intended to run such high duty cycles. What we do not yet know is how much extra capacity there is from the injectors. Maybe in the future we can also add a small safety feature already to this at later stages. In case if the pressure goes above a predermined limits then the fuel and ignition is cut off. It has happened to us in a dyno a couple of times that the hoses have got loose and the pressure skyrocketed. - Get an IAP to GM3 bar sensor mapping information. Recall that this is somewhere on this board already ? - Generate a rough mapping tool for various boost levels. I would appreciate if someone has a base map that we could use. i do have a 3-bar gm sensor values on a spreadsheet if needed,i have been working with a stock gen1 iap with vaccume punp and guage to map values also,it is almost done. This is also true in "Real World' applications.....There's been Many discussions on how Gen2's Cannot exceed about 45hp on N2O do to maxxing the injectors out, and it WILL start throwing Codes. Milliseconds would be preferred. The way how the fuel add was designed is addition to the injector pulse from TPS map. Can be either Pressure points or Pressure/RPM map. Which ever way will try to use same format. I think this chart could reveal the GM3 bar sensor mapping to replace suzuki sensors for boost applications. Next we need someone that can confirm that the actual vacuum numbers are the same on ecueditor 2 screen as those are on the vacuum pump. I dont have a vacuum pump here so can not test this. Will build the next version with these settings that should match now the gm3 sensor. I was going to post one of mine but remembered they all have large total trim values that would upset the figures. I think this was 650cc injectors in the secondarys, JG could confirm. how manycc/min are the gen 2 injectors again ?? i remember reading 230 but i think that was later changed, , if 250cc your going to be able to get around 350hp safely , any more will need bigger injectors fitted. another thought, why stop at 19 psi, and not complete the conversion to the range of the sensor ? ... wrote a summary how this works, but forum cut it to 3 lines... maybe will write a summary later. But here is the source code for embedded part that is reprogrammed to ecu. All this can be used in derivative work if the derivative work is made public as LPGL licensing. along with Hayabusa ECUeditor. If not, see <http://www.gnu.org/licenses/>. that are considered not having been assigned for any use. The shift kill variables are defined here, e.g kill times. These are adjusted using ecueditor. needs to be changed so that the results of this calculation is included in fuel calculations. Convert a 2D GM3 map to an IAP map value and store it back to ECU_IAP value. // AD conversion cycle causing LR to get lost.
" srli R0, #8 \n"
" ld24 R5, #0x80681A \n"
" ld24 R5, #0x806820 \n"
" ld24 R5, #0x80681C \n"
" st R4, @R5 \n"
I am by no means a programmer but have been tuning for a LONG time, and lot of different systems. I think possibly the easiest and best way to set up boost fueling is similar to the AEM. Basically you use 3 main maps to set up a boosted car on AEM, if one uses boost compensation style of tuning. You have the rpm/load map (this would be your main VE table, similar to the IAP table), Then the Boost compensation table (similar to the new boost table), and finallt a THrottle mod table (similat to the tps table). Then the IAP map would have the same numbers for each load range all the way through the rpm for that load range. Finally the tps table would be tuned for different throttle ranges. I don't know if this helps, or makes sense, but it makes tuning super simple and very smooth and linear style of tuning/fueling a boosted motor. I can prob post a few screen shots of some of my AEM tunes I have if that helps? With Suzuki/Denso we are somewhat limited with some given parameters they give to us without adding some complexity and therefore that limits our choises. This turbo design implementation has this map structure which is what you also explained but only for positive pressures. The boost table fuel settings are currently limited by the ecus capacity to compensate for fuel. To utilize higher pressures than 1.3bar we would need 1:1 fuel pressure regulator or at least increased fuel pressure. We shall see with practical testing where does the fuel pump and injector capacity settle with stock fuel pressure and injectors (144LPH, 4x2x250cc as I have understood so total max injector flow is 120LPH limiting the power to around 300hp which is propably around 0.8-1bar with gen2 engine.). Screenshots would be a good add to the conversation to explain the linear tuning. Also if you have screenshots of various boost maps that show the differences in the the turbos capacity to generate airflow that could explain why boost maps are different depending on choise of turbos. OK - shall give up based on keeping the 2d only, so lets make this a 3d from beginning. In lack personal experience on turbo busa tuning, need some help here. What would be the practical RPM and kPa ranges for this kind of map ? Just realized that been involved with tuning several turbo bikes, but never built a boost map for a busa from scratch with a though on RPM and kPa ranges in mind. Please remember that max 127% is practical limit for stock fuel system configuration. If there is 1:1 fuel regulator then we dont need even that much. psi is better for most people here who are going to play with it in my opinion, most people aren't used to kpa. Also its pretty safe to say if they have a turbo, they better have a larger fuel pump, which means 99% of time it will be external with a 1:1 regulator or a rising rate fmu. ill post my microtec fuel map, at minimum i would say 1000 RPM buckets, 500 RPM if possible. And maybe 2 psi increments? OK, added metric and imperial support (kPa vs Psi as units) to boost map in build 2.0.3.25. The scaling must wait a bit more as that needs building an excel sheet. I guess those numbers are milliseconds or ? 720 degrees is 10ms @ 12000rpm so at 9ms is 90% duty cycle. Then the question becomes: What is the injector capacty for that velocity racing map so that we could calculate a boost basemap for ee2 as with that we work with % o 500cc. Here are the 3 AEM fuel maps I was talking about. This is from my 94 single turbo supra at 908 HP to the tires, This car is on 1000cc inj, with twin Walbros, and a 1:1. It get's about 24 mpg if you drive it like a sane person. Careful with the AEM on Honda's though. I had it on my 94 Integra and could never get a clean cam/crank signal over 8500 rpm. Was stuck at mid 500 hp levels boosted for about a year. Tried COP with cam/crank trigger in the cam gear and was a bit better but still not right. Ended up going back to Hondata and car was finally right. 10k rpm at 35 psi on a 61mm turbo making 682 to the tires. I don't have a gen 2 to tune on. On my 07 I am on my own custom kit, S2000 injectors, air to water, 55mm turbo. I am still on stock fuel pump but bike runs perfect. 240 HP at 5-6 psi and getting 50+ mpg. My tune up is in the shared library, where ever that is lol. I have the 255 and 1:1 sitting here ready to go on with a 4 stage controller. I was going to use map switching for 3,4,5,6 gears at about 12 psi and race gas. No need for all that mess if we get boost compenstaion in some form. I have the stock injectors and can throw them back in and do some testing and tuning if it would help everyone out. I can go from total stock fuel setup to S2K; to 1:1, stock inj; to S2K, 1:1.
that is in milliseconds and using 650cc RC injectors in a secondary rail. I made 460 hp with it and was more or less out of turbo, not fueling. A smoothing or linearize hot key by row and one by column would be really great also. The stock maps are kind of all over the place on the numbers. A nice smooth fuel map does wonders for the tune up, although I did not take the time to make my maps smooth in the IAP and lower tps regions. I Have tuned 6 or 7 Microtechs on RX7's and really do not like that system. Not that It does not work, but there are much better systems out there for the RX 7's. But On the Busa I am sure it works fine for the secondary controller. Waiting to get the rest of the fuel system set up then maybe I will try and go Precision 650's and see if I can make them run clean. lots and lots of them on busas, but from what i have gathered from car guy's etc they aren't real highly regarded. They don't compensate for altitude, temperature etc, at least in the configuration all the turbo kit suppliers use them in anyway. But they do they job, been on my bike for 3 years without any issues. I have also played with megasquirt, which totally kicks the microtechs but in the ease of use department regarding saving maps without having to buy a $100 dongle, being able to tune a little more user friendly etc. The Microtech works just fine on the Busas it seems. My only gripe is the cost and the additional setup, besides the software itself. Microtech is much cheaper than Motec lol. Megasquirt is ok. The software definitely could use some work but the system works, and for 400 bucks it is very inexpensive. 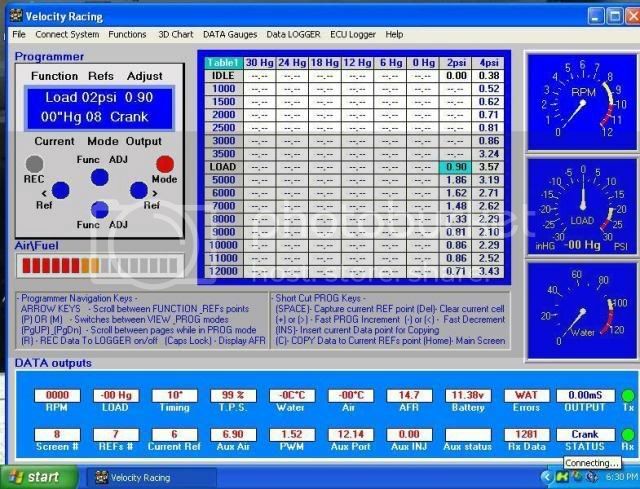 I am a big fan of stock ecu's and supporting Software. I tune a lot of LSx based cars and trucks with HP tuners, a lot of Hondas on Hondata/Neptune, and a few Subies with RomRaider. The open source stuff is great because it's free but usually doesn't have near the utility and user friendlyness as some of the the not free systems. Don't mean to get off topic or come off negative torwards anyone, just trying to contribute and help out if I can. I would assume a 1:1 fuel pressure reference. There are very few turbo bikes that do not have this, and ALL should have it, if nothing else to promote good fuel atomization rather than large droplets of fuel due to too low a pressure differential from fuel pressure to manifold pressure. I would recommend keeping the engine rpm bins very coarse at lower rpm, maybe as much as 2000 rpm or more apart, and use linear interpolation between the points. Most bikes do not have a turbocharger small enough to make boost at low revs anyway as most of us are after greater than ~30% power increases when going to a turbocharger unlike the OEM's who are shooting for much more conservative numbers with greater drivability. Basically, most of us want "stupidly high" amounts of power and don't start to get appreciable positive boost pressures until after 4000 rpm. In the higher revs, more resolution is beneficial as the potential for very rapid changes in boost exists since there is more than adequate exhaust flow to power the compressor. Also, most engines start to lose volumetric efficiecy at higher revs and start to require a more non-linear fuel compensation related to boost. I would think making RPM bins at 4.0,6.0,8.0,9.0,9.5,10.0,10.5,11.0,11.5,12.0 rpm would be a good a start. This keeps it to 10 bins assuming a (0,0) is assumed for less than 4000 rpm interpolation. Boost in 4 psi increments is probably enough, although again, higher boost levels typicaly start to get into the very non-linear VE of the engine in all but the very high end turbo applications and may be beneficial to be closer together. I suppose it really depends on the amount of memory available to implement the table size. More bins with smaller increments woudl certainly promote better tuning resolution, but also requires higher resolution tuning, making it more time consuming. Does it make more sense to make the RPM and Pressure increments open as variables as well for these initial releases and have those that do the tuning try them out and see what is the "best" ranges and resolutions? PetriK, I have noticed ther the labels for the kPa bins do not show up in the boost compensation map when switched to EU ECU. PSI shows up in the US and California selections. Once again to stir the pot.....is there a SAP ignition compensation map available in Gen2? Seems to be one in Gen 1. Might be able to reprogram it for 3-bar sensor as well and program in boost based ignition retard. The 1;1 reg is a necessity, otherwise adding pressure to the inlet side gives a corresponding reduction in effective fuel pressure at the injector . no just a trial version and it's limited. where can i get a complete version? i found out the hard way...will get a full version ASAP. petrik,do you have the part # from the gm 3-bar sensor that you based your input from? from what i've found is that there is 3 different gm part #'s,i was wondering if the input to output values are all the same?,plus it would be easier for everyone to start ordering them to test the function in ee2. For 3bar map I used a document that Greg sent me, the part number was no on those pages if I remember corractly - but as its mv/psi - baseline typeof formula, it should be quite general. We can choose to use either or, what ever you guys say that is better. Anyhow the sensor must be able to measure negative pressures for vacuum like -1bar. guys the 3 bar map sensor is very standard from what i can tell, order the ones through jegs or summit is usually the best deal i have seen, sold by MSD. going to the local part store and trying to get one usually results in the wrong one. Did some further testing on the concept and it really looks that with enough boost pressure the bike will first hit 100% duty of secondaries and after that the fuel delivery of primaries will increase until it finally hits 100% duty on priaries too. The Fuel pw will at that point show around 500@10000rpm on the Engine Data values screen. Obviously with higher rpm the 100% for both injectors threshold is lower. At some point we need to add a boost gauge and fuel add on % to ecuditor to see better whats happening with the boost applications. so would it be benificial to add bigger secondary injectors? then you would have to also change the injector size to compensate. it may be easier to control all 8 injectors that are a little bigger,and let the ecu do it's thing...?